*Update 06/12* My thoughts have changed about the book and have been noted in the comments section. 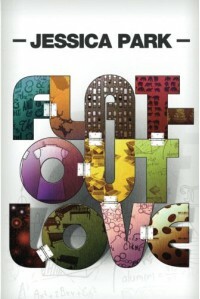 *Original Review 10/11*Flat-Out Love definitely falls more on the "girly" side, but I enjoyed it almost as much as I enjoyed Anna and the French Kiss.The story follows a girl named Julie who is swindled out of her money when she gets to Boston and finds out that the college apartment she had reserved does not exist. An old friend of her mom's living nearby steps in and invites her to live with them - in the home of a completely dysfunctional family that is falling apart. Julie manages to take refuge in the emails and Facebook updates (some of which are completely funny) of the brother whose room she is staying in while he's off "traveling the globe." I don't blame her for falling for Finn, the human version of a cardboard cutout named "Flat Finn" that the little sister drags around because she's missing her brother. Then you have the complete math geek brother who can be a pain most of the time, but you can tell he's hurting inside as well because he shoulders a lot of responsibility for the family, which also makes you want to know more about him.I can not begin to explain this book well enough to do it justice. There was so much more to the story than I was expecting when I started. It always makes a book more special for me when an author can take the reader through a range of emotions, making you giddy and smiling one moment, and feeling the sting of hurt the next.Just by the name and summary, I figured that Flat-Out Love was going to be a light and potentially funny read, and it was. But there was a lot of heartache bubbling under the surface, which I hadn't planned on.If you're one of those people who feels like you've been reading the same story over and over, then you'll want to pick up this book. It's definitely different from anything else I'd recently read.